I love anything that can be dipped into ketchup :).I used the same recipe for potato cutlets and added some tuna fish into it to create fish cutlets and it turned out just delicious. 1.Heat 2 Tablespoons of in a pan, Add 2 tablespoons of oil and fry the onions until lightly brown. 2.Add ginger-garlic paste and green chilies and sauté for 1/2 minute. 3.Add the garam masala, turmeric powder, cumin powder fry till the raw flavor is gone. 5.Add salt and Aamchur as per taste. 6.Add the cilantro and mint, Mix it well and allow to cool. 7.Take a bowl and beat the eggs with a pinch of salt and pepper. 8.Heat a Flat pan(tawa) and spray some oil on top. 9.On a flat plate spread the breadcrumbs. 10.Now take the cooled fish mixture make a small ball in your hand and press it so it becomes flatter like a cutlet. 11.Dip it in the egg mixture and roll on bread crumbs and lay it directly on the pan and shallow fry on both sides on medium heat until they turn golden brown. Serve Hot. The egg mixture should not be dripping from the cutlet when you dip it, tap off the excess or the breadcrumbs will get all soggy. 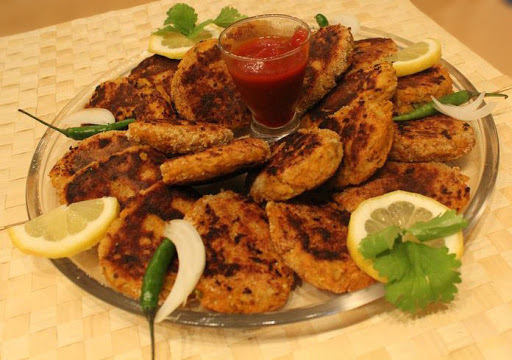 The cutlets can be served with ketchup or sriracha.